Adapted from first book of the successful series of novels for young adults by Malorie Blackman, Noughts and Crosses presents in stark terms issues of racism and totalitarian government. The world of the play is one in which the roles of black and white are reversed, though there is not much hope for a better world in the process. Here in a strictly segregated society black people, known as Crosses, have all the power. White people, known as Noughts, are subjugated. But a chink in the racist armour has appeared and a few Noughts have been allowed into a school normally the exclusive preserve of Crosses. The guinea pig in this much resented step is Callum (Billy Harris), a bright white kid who just so happens somehow to have struck up a friendship with Persephone, aka Sephy (Heather Agyepong), youngest daughter of Kamal Hadley (Chris Jack), a senior member of the Crosses and as nasty a politician as one could imagine. All would be well, if difficult, were Callum’s family were not involved in the Liberation Militia, a terrorist group that is fighting the Crosses with bombs, kidnap and murder. The fighting is not contained to the streets: the respective families are riven with conflict, united only by their distrust of the other. So much for the premise. The story contains elements of Romeo and Juliet, of course, and is deliberately and quite heavy-handedly about sectarian violence, though it references no particular conflict. It sees racism and sectarianism as universal political forces, countered only by emotions such as hope and love. As such what it lacks in subtlety it makes up for in power. And this is where I find my misgivings. 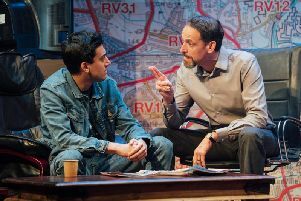 A play that is all action and issues can certainly get a message across, but nuances of character and the complexities of social conflicts are easily lost along the way. We don’t engage as deeply with the characters or the situation as we might if the play were only to deviate a little from its relentless pace. It is aimed squarely at an audience that appreciates bold colours and starkly drawn lines. As such it succeeds. The audience of people mostly in their teens were unquestionably appreciative, but I yearned for a little more light and shade in the argument. * Noughts and Crosses runs until March 30. Visit www.belgrade.co.uk to book.